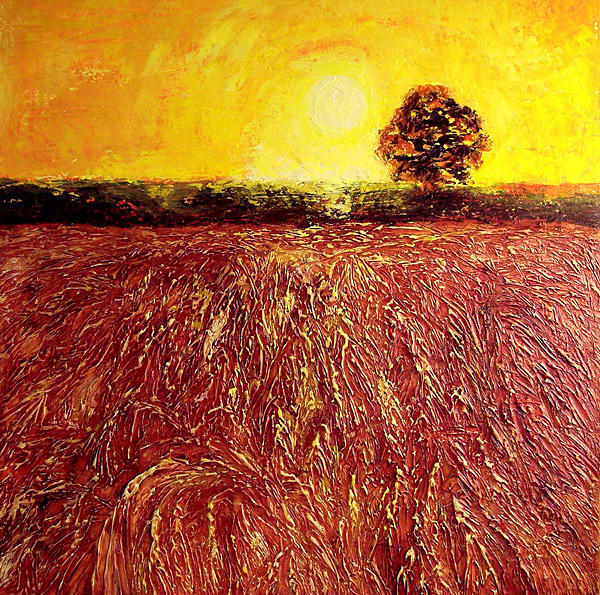 Sun-ripened Harvest is a painting by Lisa Marie Dole Skinner which was uploaded on July 16th, 2010. Description: The Harvest wheat is souls, and the field is the world. Each painting represents God relating in various ways towards mankind in His desire for men to know Him. The weather / clouds speak of the aspect of His brooding over mankind; drawing them and preparing them for the end of the age. Sun Ripened Harvest: Just as the summer sun ripens the wheat and makes it white; ready to be harvested; so does the love of God. God is looking for laborers for the harvest�Lift up your eyes�In the heat of the hot sun, the intensity of the last days brings about a quickened ripening of souls for the endtime harvest. Wow, I love the texture and the colors of this piece! Well done, Lisa!